Yorkshire Amateur League Division 1 – Saturday 2nd September 2017. Goals: Irving, J. Strudwick, Simonett. 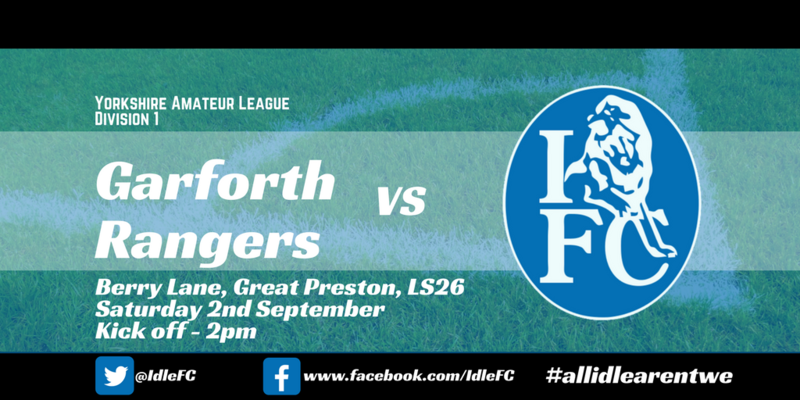 The opening day of the Yorkshire Amateur League 2017/2018 season saw Idle travel to Garforth for their first fixture of the campaign in Division 1 with a strong squad, a solid preseason behind them and a thirst for more success! It was a great day for a game of fitba too with the sun shining. But in customary fashion, the Idle lads started slowly with the opposition putting pressure on the away defence with plenty of long balls from the back. The defence did manage to cope with little fuss despite a few hairy moments and Garforth struggling to carve out any clear chances to take the lead. A first-half injury to right-back Bradley Ross following an over-the-top challenge from Garforth’s Number 4 (a consistent theme for the game for the midfield man) forced Idle manager, Rob Brook into an early change at the back with Lee Cookson coming on to make his debut at centre-back with Jamie Allen moving out right-back to fill the gap left by Ross. Idle slowly grew into the game and began to dominate the ball, taking advantage of the space on the wings with Adam Medley and Ryan Mitchell using their pace and dribbling ability to test the opposition defence. Aaron Irving clearly had a job on his hands against two physical centre-backs but as always he was competitive and held the ball up well, allowing his midfield teammates to join in. It was 0-0 at the half-time interval with Idle knowing they hadn’t really started playing to the level expected. It was important to remain calm and keep moving the ball quickly then as the opposition tired, chances would present themselves. The second half was much better than the first and Idle began to dominate the game. The breakthrough eventually came from Irving who hadn’t given either centre-back a minute’s rest all game. A free-kick was flicked on by centre-back, Carl Brown, before the Idle number 9 struck a low, curling shot from just inside the area into the bottom corner. The away lead was soon doubled after Jack Strudwick managed to fire beyond the keeper with the ball bouncing between players in the box and Garforth failing to clear their lines. There was a hint of offside but the referee gave the goal and Idle had deservedly doubled their lead. Despite the away side dominating for the entirety of the second half and Garforth’s chances remaining at a premium, the home side did manage to reduce the deficit with around 20 minutes remaining. A free-kick wasn’t cleared properly and the subsequent shot from the edge of the area was parried by the Idle goalkeeper into the path of the on-rushing striker who, unmarked swept the ball home. Garforth’s tails were certainly up at that point but Tom Simonett put the game to bed with the goal of the game. Medley worked the ball well down the right-hand side, beating his man and cutting the ball back to Simonett on the edge of the area. The ball sat up perfectly and the midfielder struck his shot sweetly with left foot with the ball curling away from the goalkeeper into the top corner of the goal! As Andy Gray would’ve put it, “Ya don’t save those!”. Idle saw the game out, securing a 1-3 victory and the first three points of the season.